MONTREAL– Last week, as the hunting and trapping seasons opened, the Ontario government announced its decision to strip at-risk Algonquin wolves of protection from hunters and trappers across the majority of their range. Ongoing hunting and trapping, the primary threats to the species, caused the wolves’ at-risk status to deteriorate to Threatened on June 15th 2016. A mere 154 adult wolves are left in Ontario. Conservation and animal rights groups from across North America are condemning the decision. 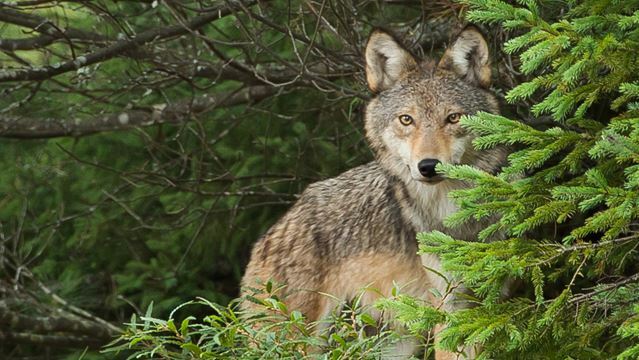 Ontario claims their decision is justified due to the inability of hunters and trappers to differentiate between coyotes and Algonquin wolves. Without genetically testing each animal killed, the government cannot track how many Algonquin wolves are killed. There is no limit on the number of wolves that can be trapped and hunting bag limits are absent in some parts of the wolf’s habitat. Hunting and trapping were banned in the townships surrounding Algonquin Provincial Park in 2001 due to overwhelming public concern for the park wolves. This year, public concern has been ignored – the majority of the 17,301 comments submitted in response to the proposals opposed the regulation changes. “Allowing these rare wolves to be killed is not only inhumane and shameful, it can have unintended consequences for farmers and the animals in their care. A growing body of research shows that hunting and trapping can increase future livestock depredation by causing social chaos amongst wolf and coyote populations,” noted Gabriel Wildgen, campaign manager for Humane Society International/Canada. “If the government was actually serious about protecting farmers’ livelihoods, they would subsidize non-lethal strategies to prevent depredation in the first place. This decision not only endangers a threatened wolf species, it also fails the farming community.” remarked Lesley Sampson, executive director of Coy ote Watch Canada. This does very little to enhance Ontario’s reputation across the world. It has always puzzled me why humans appear to hate wolves more than any other large predator. Then I read an essay by a woman who spent a considerable amount of time with wolf hunters. I also asked several biologist and ecologist friends. Finally, I wrote a blog post about this on my website, http://www.julianalightle.com. My take on this: wolves and humans share many traits. Humans project the worst and best of themselves onto wolves, both hate and love. For some, they bring out what they most fear in themselves. I’ll make sure to bookmark it and return to read more of your useful information.